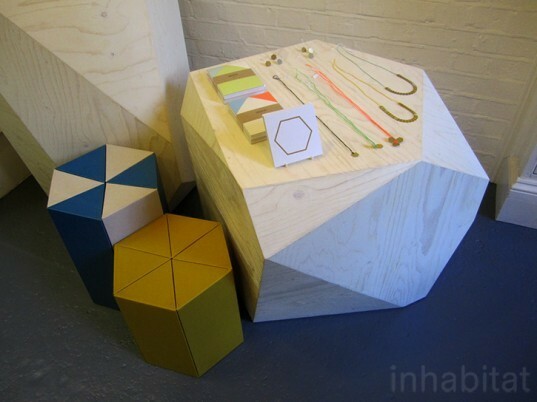 The Shoreditch Design Triangle, with its mix of galleries, boutiques, bars and all-around East London cool, is always a highlight of the London Design Festival. This year, salvaged materials and local production were key themes from emerging brands like East London Furniture to design stars like Tord Boontje Studio. Read on for some of our favorites! 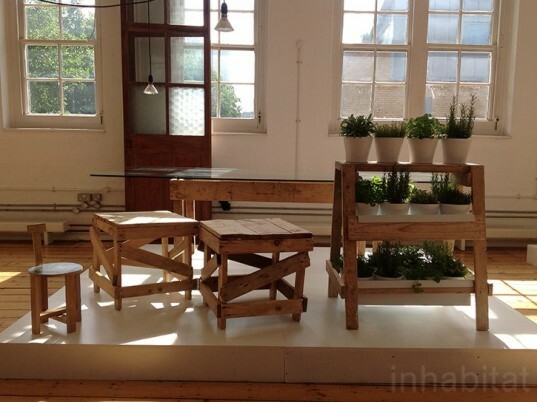 East London Furniture completely transformed bar and gallery space DreamBagsJaguarShoes. Fixtures, tables and seating were all made from salvaged materials – including British Gypsum pallets, wood from a construction site, and pine scraps from a lumber yard. 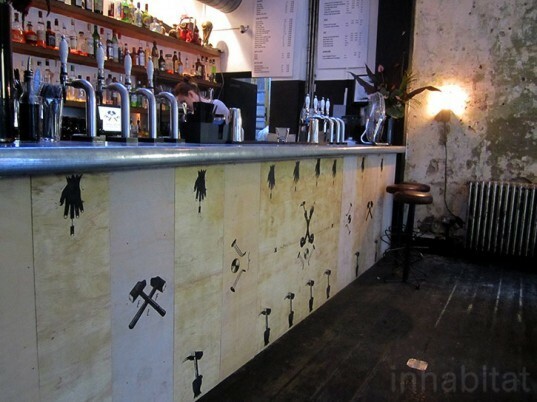 The bar was given a facelift with lumber yard scrap wood screen printed with illustrations from Alessandro Mistrulli. Lee Broom turned his East London showroom into The Crystal Bulb Shop – a general store complete with a sawdust floor – using vintage and upcycled materials. He’s incorporated reclaimed parts of an English pub, previously used in another incarnation for his successful show in Milan. The Old Shoreditch Station featured living chandeliers with low-energy Plumen lighting from Hulger and Sky Planters from Boskke. Boskke launched the Sky Planter Clear, a translucent planter that shows the soil, roots and water. At Momosan Shop, shape-based products in the “Hexagon” show included plinths made from scrap plywood and reissued cardboard stools originally designed by Riki Watanabe in 1965. 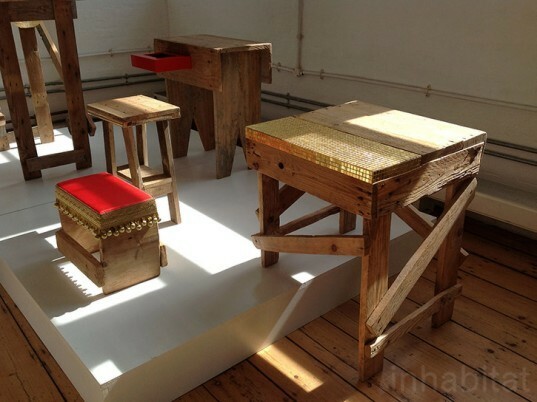 New work from Rupert Blanchard included cabinets and drawers using salvaged materials. The horse lamp is vintage kitsch. Rupert Blanchard‘s new seating collection was made by local manufacturers with materials sourced from the area. 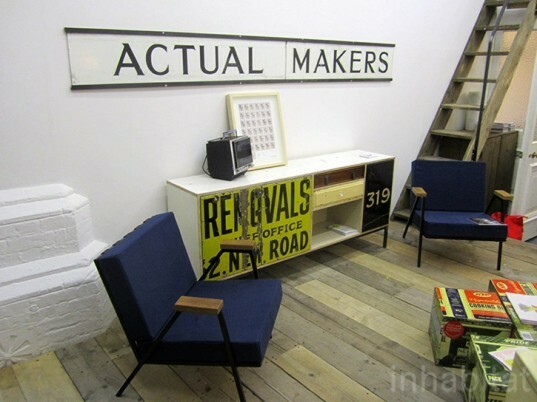 The “Actual Makers” signs were found when he first moved in to his studio. Duncan MacAskill‘s portraits and abstract artworks made with thumbtacks and push pins made a colorful display in Ally Cappellino’s shop. Tord Boontje Studio presented Cherry Pip Jewelry with Swarovski crystal (incorporating cherry pits brought back from Sweden) at the Squirrels Electro Garden Party. Tord Boontje also launched this Lightweight set of Luminaires – a new lighting collection self-produced in Tord Boontje Studio and sold exclusively in the East London shop. 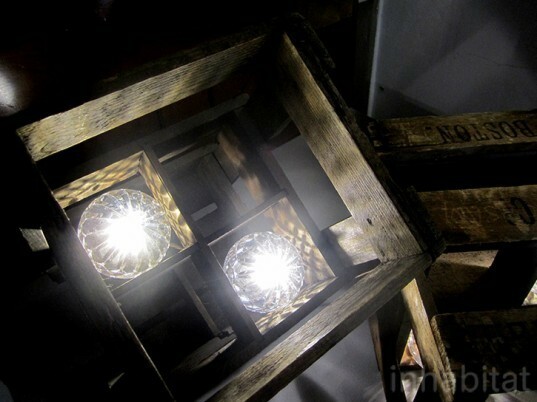 The base of the lamps are copper baskets that you’re meant to fill with rocks or other heavy things, saving the cost and waste of transporting a heavy lamp base. Gallery Fumi’s latest exhibition Prostheses and Innesti is a collection of works initially created by construction workers on Brazilian architect Marcio Kogan‘s building sites, and then reinterpreted with gentle interventions by the studio. The raw wooden pieces were taken directly from the construction sites and adapted with materials like gold, marble, glass and textiles. 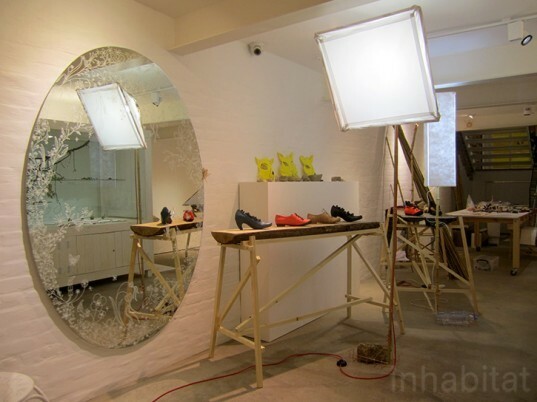 East London Furniture completely transformed bar and gallery space DreamBagsJaguarShoes. Fixtures, tables and seating were all made from salvaged materials - including British Gypsum pallets, wood from a construction site, and pine scraps from a lumber yard. 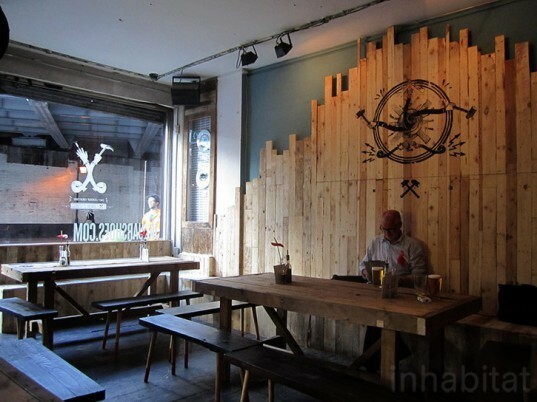 The bar was given a facelift with lumber yard scrap wood, screenprinted with illustrations from Alessandro Mistrulli. 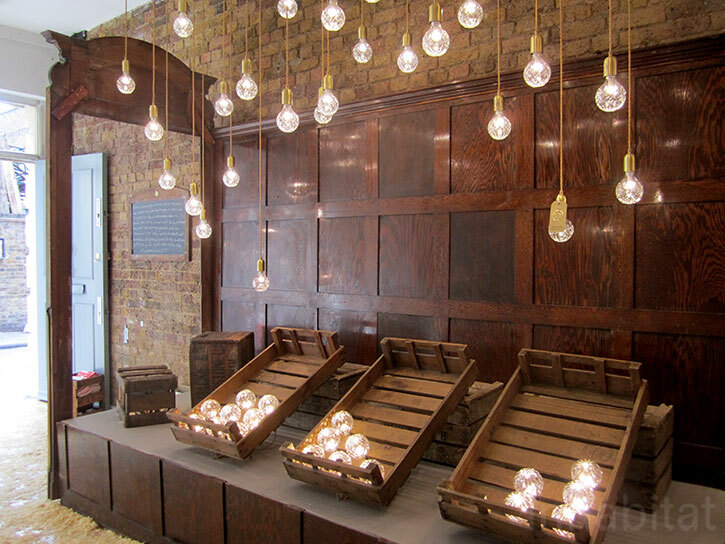 Lee Broom's Crystal Bulb Shop incorporated reclaimed parts of an English pub. 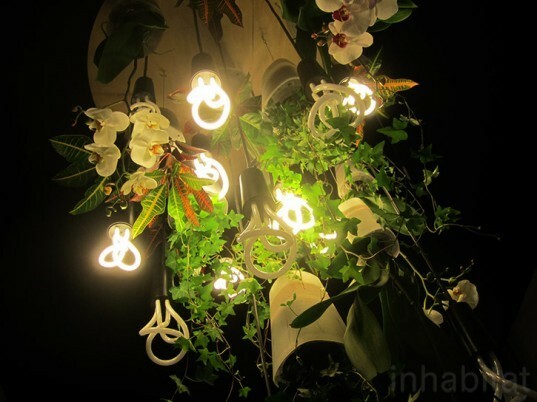 The Crystal Bulbs, made in Cumbria, were displayed with vintage and upcycled materials and objects. The Old Shoreditch Station featured living chandeliers with low-energy Plumen lighting from Hulger and Sky Planters from Boskke. At Momosan Shop, shape-based products in the "Hexagon" show included plinths made from scrap plywood and reissued cardboard stools originally designed by Riki Watanabe in 1965. 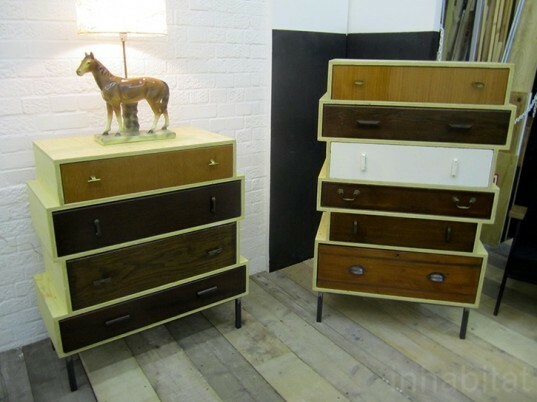 New work from Rupert Blanchard included cabinets and drawers using salvaged materials. Rupert Blanchard's new seating collection was made by local manufacturers with materials sourced from the area. 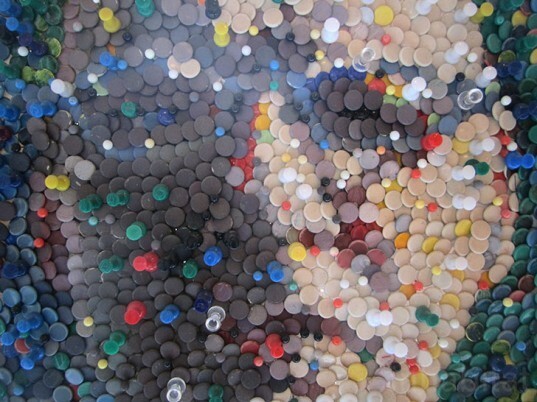 Duncan MacAskill's portraits and abstract artworks made with thumbtacks and push pins made a colorful display in Ally Cappellino's shop. 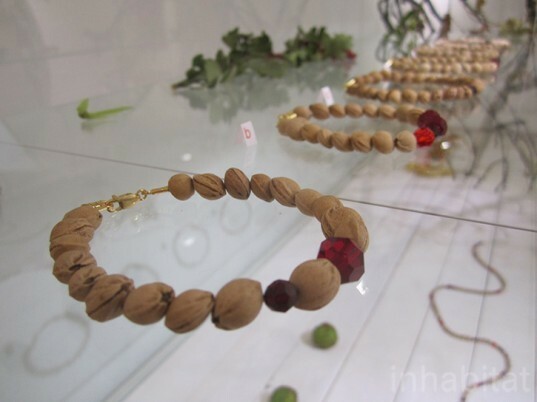 Tord Boontje Studio presented Cherry Pip Jewelry with Swarovski crystal (incorporating cherry pits brought back from Sweden. Tord Boontje also launched this Lightweight set of Luminaires - a new lighting collection self-produced in Tord Boontje Studio and sold exclusively in the East London shop. Gallery Fumi’s latest exhibition Prostheses and Innesti is a collection of works initially created by construction workers and combined with materials like gold, marble and textiles. The raw wooden pieces were taken directly from Brazilian architect Marcio Kogan’s building sites and given gentle interventions.